A year after his wife's death, Iain MacLean still blamed himself. He had loved his wife, but she wasn't the love he was fated to have, at least according to the MacLean legend. Perhaps had she been the one, he would have been able to save her. With guilt whipping him into a constant state of rage, Iain finally commits a deed that a simple apology won't salve. His brother, the laird, sends him on a pilgrimage, with instructions that he is unwelcome to return until he is capable of controlling his anger. Madeline Drummond was on a pilgrimage of her own - a pilgrimage to kill the man who had tortured and murdered her father, and so many others at Abercairn Castle. What she never expected was to be rescued by her Shadow Man - the man whose sorrow and loneliness she could feel, months before they ever met. 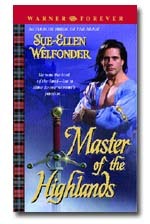 With Master of the Highlands, Ms Welfonder continues to prove herself as a master of writing. Craftily weaving powerful emotions, engaging characters, and a tinge of humor, Ms Welfonder has written yet another "Keeper". Those who read Knight In My Bed will be thrilled to see the MacLean clan again.